Releasing the A3 debut model in 2012 at Geneva Motor Show, Audi started to increase its line-up with convertible version of hatchback. It was the 2013 Frankfurt Motor Show that company unveiled the all new Audi A3 Cabriolet 2015. The new release brings with it decent looks and more engine options to satisfy its buyer’s needs and simultaneously keep its position in the competitive automotive market. 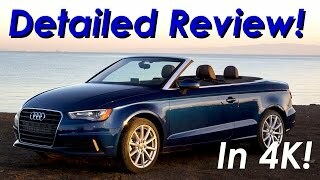 Let us go through the review of Audi A3 Cabriolet 2015 and see what all features it has to satisfy us. Interior of Audi A3 Cabriolet 2015 is very much identical to its hatchback sibling and being true this is what was expected. Instrument panel gets a slightly leaned shape with front getting a curved design while the center console gets a bit inclined towards the driver. Control panel on other side features design resembling to turbines while the flat bottom steering wheel t gets an all new design. Dashboard in all looks clean with controls being placed at the right place and in right way, proving to be passenger and driver friendly. 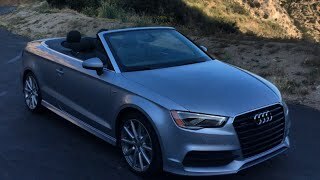 Audi A3 Cabriolet 2015 also brings some good options with it, like the drop top driver information system, Bang & Olufsen sound system accompanied with MMI navigation plus with a seven-inch monitor. Exterior of Audi A3 Cabriolet 2015 too holds the legacy we have been seeing since past few years. Starting with the front fascia of Audi A3 Cabriolet we have the traditional single frame grill sitting proudly between the headlights, which come with an option for LED. Beneath them are large air intakes incorporated in bumper, providing more fresh air to its tires. Moving towards the rear fascia of Audi A3 Cabriolet an aluminum frame adores the windshield and the same design trend follows in form f a strip running across the car. Over your head is a soft-cloth top made on lightweight, magnesium-steel kinematic mechanism and can be open or closed up to speed of 31 mph taking 18 seconds in whole process. 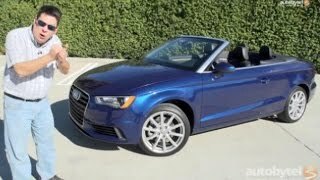 The all new Audi A3 Cabriolet 2015 comes with three engine options; first being a 1.4 Liter TFSI engine delivering 140 hp while second being a 2.0 Liter TDI generating 150 hp and last being a 1.8 Liter TFSI delivering 180 hp. Though company hasn’t revealed the performance specifications but has shared that they’ll be releasing more engines for the model.